Purchase Guarded Key on Apple App Store and get Registration Code for free. 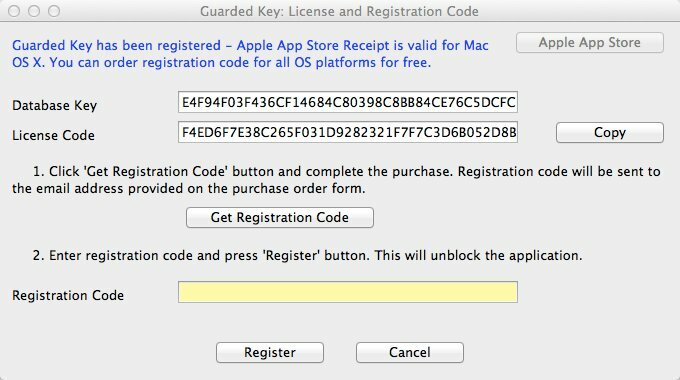 If you have already made a purchase on Mac App Store you can get Registration Code for free. You will be able to create your portable password manager and use it on any computer and any OS platform (universal license). Start Guarded Key application on your Mac OS X and navigate to Menu -> Product Registration. Click "Get Registration Code" button to open browser and load "Registration Request" form. Enter your email address and submit. You will receive FREE registration code. When you receive registratin code, copy Guarded Key application bundle and database to another location (your desktop or USB drive) and register your database using these steps.